Colors of Spring in a plate! Spring is showing it's color every where around us. 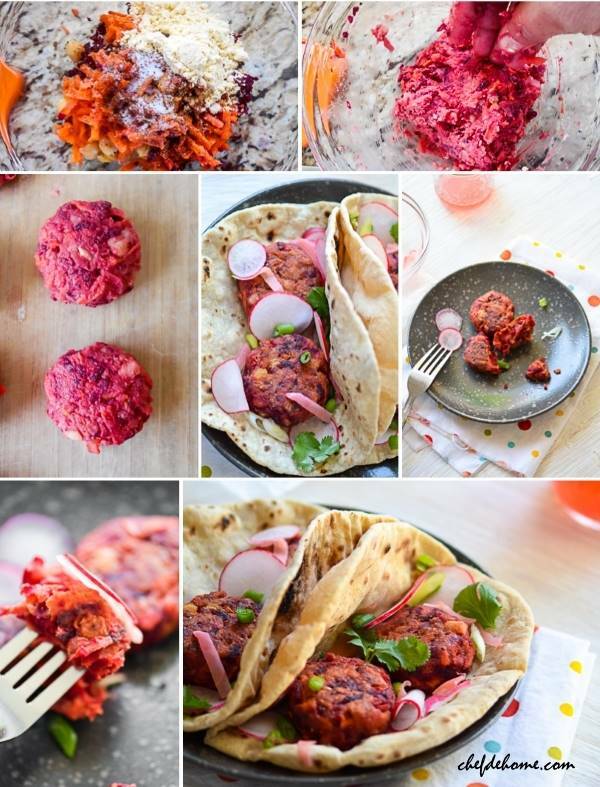 Today, I have tried to capture few of the colors in my healthy and vegan, Beets and Carrot Falafel Tacos. 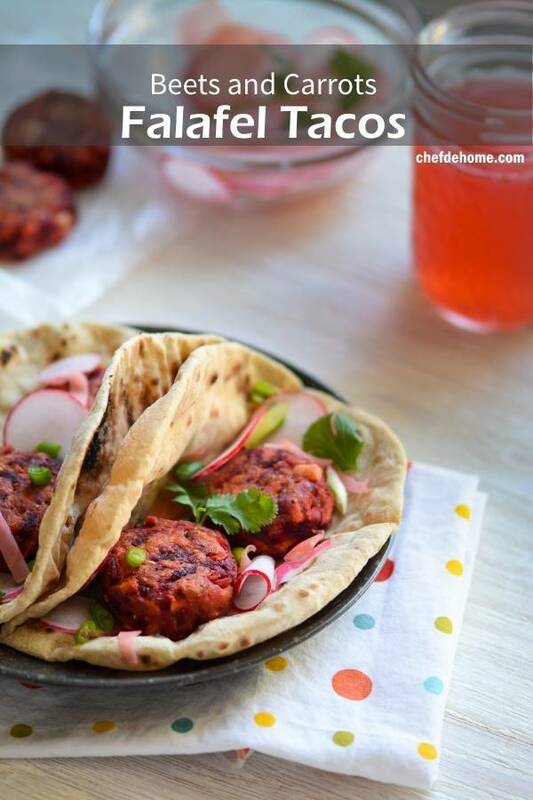 Served over wheat tortillas with sweetness of beets and carrots, moist texture of chickpeas, and hint of spices, these Falafels are not just bursting with flavor but are also fit and healthy for you! Yesterday, I made these tacos for lunch and captured a few shots to share the recipe with you. 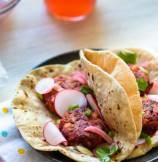 The inspiration behind these tacos were: beautiful colors of spring and my love for chickpeas. Chickpeas are one of the widely popular grain all over world. And very famous for being gluten free, good source of fiber and protein. I often love adding chickpeas in curies, salads, and stews. I chose to call'em tacos, but essentially you can also call'em Falafel Wraps, if you prefer. Tortillas used are homemade wheat flat breads. However, Falafels are gluten free, so if you want, use Corn Tortillas to make Gluten Free tacos. Ask me, I won't mind even eating the Falafels alone with some ketchup on side. Sweetness of beets and carrots, plus moisture of cooked chickpeas keep inside moist yet outside gets crispy due chickpea flour. 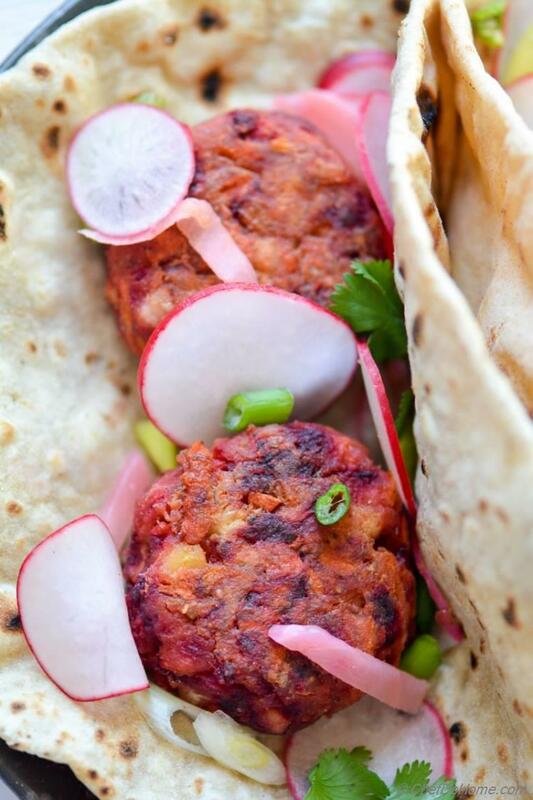 I topped my beet falafel with some fresh sweet radish, pickled ginger, scallion, and cilantro. Trust me, I didn't find need of any sauce or crema on these falafels. Just a splash of lemon compliments the sweetness of Falafels very well. All-in-all a great lunch, perfect to pack for school, or wrap and eat on go! Not messy yet bursting with fresh flavors of spring. Worth mentioning that these are also healthy for you. Vegan, gluten free (if you use corn tortillas), nut-free, and have good serving of vegetables as well! I hope you like my take on "spring in a plate"! Enough of me chatting! You tell me, what are your favorite flavors of spring? 1. 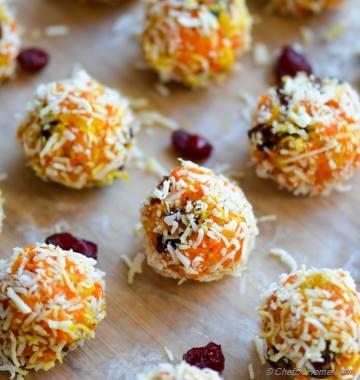 In a bowl, mix all ingredients - grated carrot, beet root, garlic, cumin, mashed chickpeas, pepper powder, salt, and chickpea flour. 2. Mash with hand to bring everything togther. Use a tsp chickpea flour more at a time, if mixture is too wet or sticky. 4. To assemble tacos, warm tortillas on gas-grill until nicely warm and pliable. 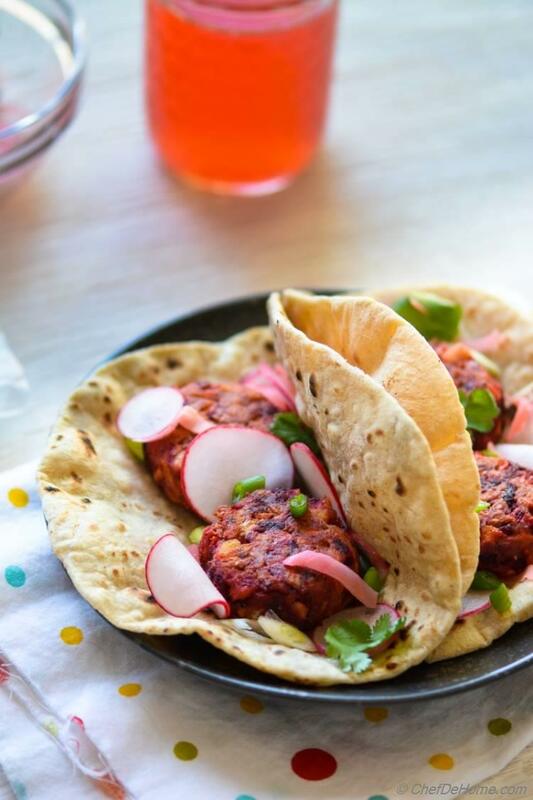 Top each taco with 2 falafel, pickled ginger, radish, and cilantro, and splash of fresh lemon juice! Serve and enjoy! Falafel are also gluten free. Just use corn tortillas instead of wheat to make gluten free tacos! Loved this recipe! I have another beet burger recipe my family loves, but it's very time consuming and requires you to roast the beets first. This was so much simpler and delicious. I added coriander and time. 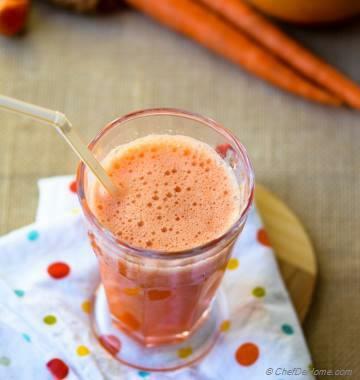 I also added the vegetable and fruit pulp from a juice I made earlier. Thanks! Could I substitute regular flour? It&#39;s all I have at the moment. Kristin, yes you can. I would add it 1 tbsp. at a time until consistency is so that falafel hold together. Don't add too much or it can get dense. I hope it helps. I'm making them this week! Debra, I hope you like'em when you try. Medha, these falafel taste delicious too and I find no need of cream! Beautiful how they turned out and really a smart idea! These tacos look amazing! And vegan? BONUS! Such beautiful tacos. I think people are missing out on vegetarian tacos. I love them. Dannii, even I love veggie tacos. non-veg taco in my home always accompany for veggie ones for me :) thanks for stopping by! love hearing from you. gorgeously awesome Savita. Believe it or now we made tacos yesterday and was staring at the lone beetroot in the fridge wondering if I should use it. Now on seeing yours I am definitely am going to. Great! No wonder you had tacos, Anu! everyone loves tacos! I bet you gonna love these falafel tacos too! do try! Wow, these sound delicious! I love that you used beets to make the falafels. Very creative. :) PInned! Linda , thanks! I'm glad you like these beets-inspired falafels :) Also, thanks for the pin and for stopping by :) Happy connecting with you! Wow! What a colorful and healthy way to make falafel! 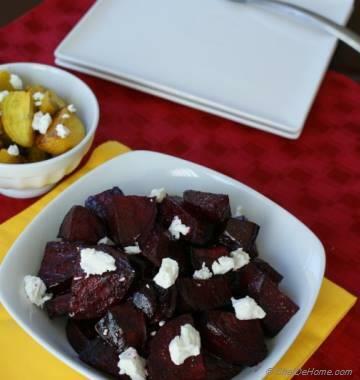 I love beets so much and never would have thought to use them in this way. Great recipe! Beets falafel sounds interesting and of course delicious! Pinned to try these tacos! Mira, thanks :) trust me, these beet falafels taste delicious. Also, thanks for the pin my friend!